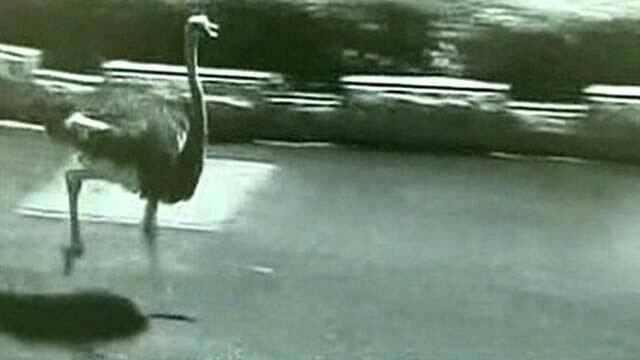 A runaway ostrich has survived being hit by two vehicles after making a mad dash along a busy highway in China during peak hour. CCTV footage shows the flightless bird disrupting traffic and bemusing motorists as it weaves through cars on a road in Zhangzhou City, Fujian province. The video, filmed on Tuesday night, shows the African native animal running along the side of the road with traffic before it is hit by an oncoming vehicle near a pedestrian crossing. But the ostrich appeared unfazed by the collision, getting up and fleeing the scene of the accident at pace. A short time later the bird was hit by another oncoming car but once again quickly picked itself up and continued to run on the highway. Police spokesman Huang Weiming said his officers struggled to capture the runaway bird because they had no previous experience dealing with ostriches. YouTube link. BBC News link. The animal was eventually captured and has been taken in by a zoo in China's southeast. Despite being hit by two cars the bird did not appear to have suffered any serious injuries. It remains unclear where the animal came from.